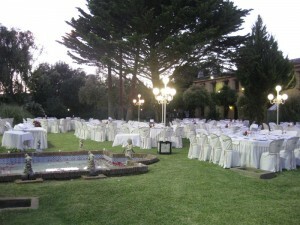 Thanks to the location of the farm Cortijo Galvan, each year taking place in their gardens for unique weddings and events. Weddings different Andalusian provinces such as Granada, Seville, Cordoba, Malaga and of course we also celebrate wedding receptions for boyfriends from other parts of Spain and abroad. Ceremonies at the farmhouse for weddings: Yes, we celebrate civil unique weddings. Exclusivity of space: Yes, just celebrated a wedding day. Professionals exclusivity agreement for the wedding: You can choose the catering for your wedding that you like, freely, also you can advise and manage this service to despreocuparos and to make easier the preparations for your wedding, if so you wish. Each unique wedding held in our farmhouse is unique and special, therefore requires a personalized treatment. From an exclusive civil ceremony, held outdoors in the gardens for weddings in Malaga Cortijo Galvan, up original wedding feast our magnificent tent for weddings and events.